Explore the unexpected ways that innovative play space helps children and communities grow. 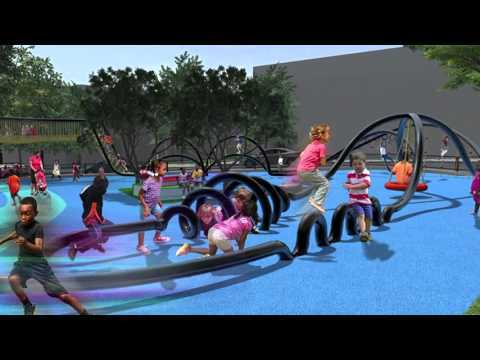 Together, we can design a more playful Philadelphia! Why focus on play space? Play is an essential part of every child’s life and a vital component of learning. Play encourages imagination, independence, and creativity. Play teaches problem solving while encouraging social, emotional, intellectual and physical development. Play spaces offer children and their caregivers opportunities to interact, teaching them patience and understanding and strengthening basic social and conflict resolution skills. They provide a venue to build strong interpersonal relationships, making them a crucial element in healthy childhoods, strong communities, and family friendly cities. Yet many families, childcare centers, and schools in Philadelphia have limited access to high quality outdoor play spaces or use play spaces that fall short of being rich environments for learning and play. Play Space challenged designers, public leaders, educators, childcare providers, families, and communities to share their perspectives on play space and to re-imagine outdoor play spaces for Philadelphia’s libraries, recreation centers, schools, sidewalks, and yards. Read all about "where design comes into play" in our special report on Play Space in GRID magazine or download the PDF. Learn more about Infill Philadelphia and the community development opportunities we've explored.